HeartSmart classes are fun and relaxed!!! We are Instructor owned and operated by a RN/Paramedic, giving you someone with experience in hospital nursing as well as pre hospital medicine. We offer a full training facilty at our offices, where you will get hands on practice with simulation equipment, not just classes with minimal or no equipment. We specialize in private classes at our office, or yours, with scenarios designed to meet your needs. Choose a class that has Instructors with real experience and the best equipment for you to practice with!! Group discounts available. We use Prestan manikins that light up red if you need to increase your speed and depth, then turn green when you hit a rate of 100 compressions a minute. You will hear audible “clicks” to show proper depth of compressions. This allows you to monitor your own technique and make adjustments. 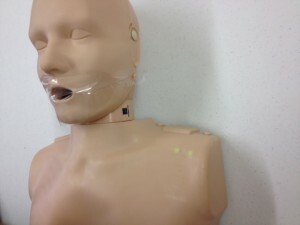 They also provide proper airway positioning to allow ventalations to make the chest rise. 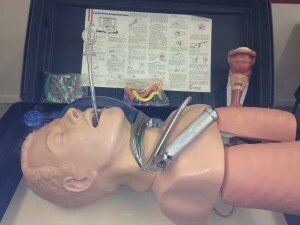 This mannequin allows for NPA/OPA insertion, and nasal or oral intubations. For a more difficult scenario, there is an inflatable stomach to simulate vomiting. You will be able to see the lungs fully inflate with proper ventilations. Practice using a bag mask and LMA’s. You will see the anatomy of the airway to get a visual of what is actually happening during ventalations. It can also be used to practice gastric tube insertion.